Home / News / Savyasachi concept never before in Indian cinema! Savyasachi concept never before in Indian cinema! 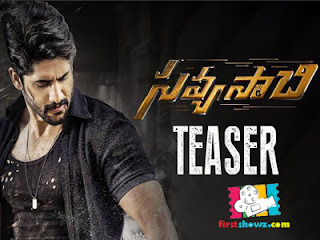 Naga Chaitanya’s Savyasachi teaser is out, and he is quite excited about this unique and intriguing concept never before seen in Indian cinema. "A concept I’ve been really excited about .. Hope you guys like it ! Here it is .. #SavyasachiTeaser," tweeted Naga Chaitanya. In the teaser, the concept of Vanishing Twin Syndrome is revealed along with some action elements, thrilling factor and major cast. Naga Chaitanya plays lead role as Savyasachi who has special attributes, like a person sharing blood and body of twin brother, existing within him. Chandoo Mondeti is the Savyasachi director. The teaser shows Nidhi Agarwal, the lead lady, and Bhumika in a crucial role. Madhavan who plays antagonist is seen at the end of the teaser in a deadly look. Mythri Movie Makers Banner is producing it. Savyasachi will release on November 2.